Anyway, since this is a brand new item that is probably of interest to a lot of people doing home recording, I thought I'd keep a diary of what happens... I picked up five write-once CDs and one re-writeable CD ($29.95 - ouch!) to play with. CDs can be played on any CD player, but they must be "finalized" first. A multi-write CD can be "unfinalized" and more tracks added; a write-once CD cannot - once it's finalized, that's it. Unfinalized discs can be played in the "recorder" side but not the "playback" well. unit does include internal diagnostic check program... may we never need it! analog recording input can be set at -3db, 0db, 3db, 6db. when recording from digital inputs, it goes into pause mode after 20 seconds of "no signal," and I've heard that the "no signal" threshold is set pretty high on some other Philips decks. This may be a problem for people trying to dub Grateful Dead tapes to CD, where there may be more than 20 seconds between songs... however, the manual also suggests that this may be controllable in conjunction with the "auto-track" feature which puts auto-IDs on the CD. Don't expect this to be a problem for what I'll be using the unit for. wireless remote appears to only support "playback" functions; record functions need to be done from front panel. Not really a problem for me. if the unit detects a non-audio track on the CD, it will just skip it. Not necessarily a problem, just a fact of life. But it means you can't use this unit to copy computer CDs at all. the "troubleshooting" section mentions "20 second pause between recordings." What I think this means is this: if you are recording from DAT, and you stop the DAT player, the CD recorder will not AUTOMATICALLY stop until it has seen 20 seconds of silence. So if you're dubbing individual tracks from DAT and stop the DAT player, the CD recorder will continue recording silence for another 20 seconds; then when you start up the next input track, there will be a 20 second pause in there. Workaround: when the music is done on the DAT, press the stop (or pause) button on the CD player. the "auto start" modes for the CD recorder have a reaction time of 200 milliseconds or so, which may be audible at the start of a song. Workaround: start recording manually. Tried a real basic, double speed dub of a complete CD (a "one-off" one that I had done for me a year or so ago) and it seemed to work fine. Plays in my 1990-vintage Denon CD player; played a few tracks at the start, a couple in the middle, and a few at the end, with no problems. Copying onto a TDK CD-R (non-rewriteable). Hey, what was that I was saying about new technology? So... back to Fry's tomorrow, I guess. On the brighter side, there is one really cool thing that the machine does when recording from analog: each time you hit pause, while you're finding the next song to track, it puts an index mark right there. Meaning that I don't have to worry about getting the recorder going, starting the cassette deck, and adding an index mark all at once. One thing I'm glad of: I'm glad I wasn't copying one of my original CDs in the machine when this happened... I would hate to have them sending it off to Philips service dept. with the master copy of one of my own CDs sitting in the "play" deck side. The replacement deck seems to be working out - I was able to master about an hour's worth of songs mixed down from my 8-track home studio setup, and the resulting CD plays on the CD drive on my computer at work. Comment on analog mixdowns: the unit provides VU meters, but does not give any indication of "margin" the way a DAT deck does. Philips suggests mixing so that the levels reach the top of the blue indicators but don't go into the red; I was mixing so that the levels went into the red a little bit now and then. My suspicion is that this is still a margin of maybe 6 db - I'm going to borrow a friend's DAT deck and use it to see if I can figure out what sort of margins I'm actually getting on analog dubs. What this means in real, practical terms: if your digital margin is any more than zero, then your mixdown CD isn't going to sound as "loud" as commercially produced CDs. More info on this once I get some numbers. I also want to try going "over margin" on an analog recording, just to see what happens. I can do that on DAT mixdowns, and as long as it's only an occasional "over," it's not even audible. Thanks to those who have sent email... as noted in the FAQ below, I have my reasons for not going the computer CD-writer route. And I know there are lots of other CD writers out there, but the CDR765 is what I bought, and what I'm reporting on. Any questions people send, I'll try to figure out and add to the FAQ section. One other nice thing I'll say about the unit: on the analog mixdowns I did over the weekend, I can't hear any "clicks" between tracks where I paused or stopped the unit while setting up the next song. I am, admittedly, listening at a fairly low volume today, due to some weirdness on my computer; nonetheless, on the DAT mixdowns I've done in the past and had transferred to CD, clicks between tracks have been a rather annoying constant... so score another point for the CDR 765. Still working! Haven't done anything new and adventurous since last time; haven't had any new problems. On the 2x copy I did last night, there's a little skritch on the very last song that I don't _think_ is on the master - it's not a skip or a dropout or anything, just a little bit of distortion on one of the loud drumbeats. But it could well be there on the master, and I just never noticed it before. Everything else seems to play fine. Been talking to my brother in the Bay Area; I'm gonna bring along the CDR and some of my old, old 4-track masters when we go up there for the holidays (he's got my old 4-track deck, and I've got a few songs that I can't even find cassette mixes of, that I want to dub to CD for posterity). Well, here's something that's just so stupid I wouldn't even have imagined it: I went to Fry's a couple days ago and grabbed six CD blanks off the shelf... got looking at them this evening and two of them had stickers on them that indicated they were "returned product" but assured the purchaser that Fry's covered the manufacturer's warranty, blah, blah, blah. Well, guess what? I stuck these two "blank" CDs in the drive and both of 'em had stuff written on them! 'Nother trip to Fry's in the a.m. But... why, why, why would a store re-sell returned media like this? Particularly "write once" CD-ROM blanks, which can't be re-used once they've had anything written on them???? Unfortunately, I needed 'em, 'cause I'm going to take the deck up to the Bay Area with me when we go for Thanksgiving, and my brother (who has my old 4-track r-t-r deck) and I are going to sit around "rescuing" songs off some of my old 4-track masters, and I don't want to have to stop 'cause we ran out of blank CDs. Okay... took the CDR765 up to the Bay Area, did an all nighter the night before Thanksgiving with no problems. Mixing analog stuff to CD; put four songs on the CDRW, but haven't done any more with those yet. When I was talking to Terrapin, they said that they've been told that Kodak is supposed to be coming out with audio-type CDR blanks, and that the price may even be less than $6 apiece! Still in the rumor stage, but there may be more news (and maybe even product) in a week or so. So keep yer eyes open. By the way - if anyone has tried the "swap trick" using the CDR 765 and either verified that it does or does not work, could you let me know? I've receieved several questions on this, and, while I'm too wimpy to try it myself (see FAQ item 2), I'd like to be able to give a better answer than "I don't know..."
Stopped by Fry's and they've stocked up on blank CDs, so I picked up ten more and I'm back in business :-) They seriously stocked up on blank CDs! Discovery on VU meter levels on the CDR - this DAT tape was mixed so that the margins on most of the songs were 0 (and a couple of the songs actually had a couple "overs" while recording, which, in my experience, are not audible problems), and my best guess at correlating the CDR 765 vu meters is: when one "red" led segment flashes on the CDR 765 vu, you're probably in the range of 0 db margin. When two or more red led segments flash on the CDR 765 vu's, you're probably "over margin." For those who aren't familiar with the terminology: 0 vu is the "loudest" signal that can be recorded on a CD; 0 vu means, basically, "all bits on." So any time you go "over margin" it means there's lost data, and, potentially, audible distortion. Some people are very religious about never going over margin (or anywhere near it); I'm not so picky. But what this suggests is that if you mix analog input so that you get an occasional flash of the first red segment, you should be getting a reasonably "loud" CD. Just a quick note - verified that my CDRW disk, even though it has been finalized, won't play in my old (1988 or so) Denon CD player. So, although the Philips manual suggests otherwise, I would not advise assuming that you'll be able to play rewriteable disks in a standard CD player... might be important if somebody's thinking of buying the single-well recorder from Philips, mixing to CDRW and then dubbing to CDR when finished. CDRW will, as already noted, play in the "play" well of the 765. It has now been confirmed (by one of my email correspondents) that the CDR 765 will NOT allow the "swap trick" to work. The CDR 765 checks for the "audio code" on the blank CD any time a new blank is inserted, even if the drawer is "pried open" and the non-audio CD inserted that way. Prior models (the 870, for example), only checked when the "door open" button was pressed, but the 765 checks any time the blank changes. Did a couple more analog mixes over the weekend; no problems. Did a little experiment with the SCMS copy protection scheme this morning and was disappointed to learn that second-gen copies are NOT copyable on this machine - see the FAQ below for details. Basically, it means I can't mix down to CDRW (which would give me the ability to re-mix tracks that don't come out right), and then create a CDR "master" of the finished mix and use that CDR for further digital copies. Got email from Nick Verban, who says, "The guy at Cassette House informed that the Kodaks will worrk at 2x speed, but that remains to be seen..."
So I called up Cassette House and ordered the 30-pack of Kodak CD-R blanks - came to about $96.50 with shipping and whatever... half the price I'm paying right now :-) Who knows, maybe I'll even get around to putting some of those old Spanky and Our Gang albums on CD one of these days :-). Email from Jbeau Lewis today, another 765 owner, who said that he saw (and has ordered) the Kodak "audio" blanks from American Digital - he ordered 50 and got them for $2.89 apiece. The prices are a-comin' down on these things! Following email a couple days ago from Christopher Simmons: "FYI -- Watch out for the Memorex 5-packs of rewritable CDRW that come with 5-free regular CDR discs (sell for about $30 at Best Buy and others). While the cardboard holder says "digital audio" in the little Compact Disc logo, the actual discs in the bundle are NOT audio ready for our Philips machines and the actual discs and disc case cards don't have the "digital audio" on them, even though the external cardboard wrap does. All of the ten-packs at my local Best Buy were labeled the same way, without having the right discs inside." As you've noticed, I haven't been updating this page too regularly. The 765 is still working, with no surprises (except for one minor weirdness, described in the log section below). I've used up all but one of the 30 Kodak CD blanks I ordered in January. 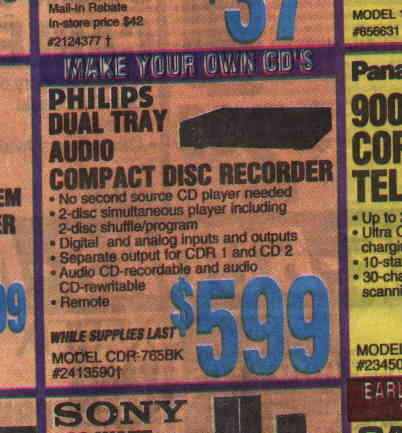 Anybody who's looking for audio CDRW discs, Crutchfield has the Philips ones for $9.99; 1-800-955-3000. Cassette House has another brand for $12.95. Thanks to Richard Benowitz for making all the phone calls to find the best price at Crutchfield! I've also been exchanging email with Richard (and a couple other people) about using CDRW's to "master" a CD, then copying the result to a CDR which you'd use as your master for making further copies. The problem with this is that the CDR would have SCMS protection turned on, so you wouldn't be able to make digital copies. One solution to this might be: if you know somebody who can copy CDs on a _computer_, the computer software doesn't know about SCMS, so you should be able to make a bit-for-bit copy of the CDRW onto CDR, and the CDR should still be digitally copy-able. (Some computer software may even have the ability to turn off the SCMS bits altogether, but at least it should let you make a copy-able copy of your CDRW once you've got good mixdowns of all your tunes). The other issue that came up was - as you're collecting mixdowns on CDRW, it would be nice to be able to take that CDRW around and listen to it in your car, on a friend's stereo, etc. Unfortunately, most audio CD players - home and car - won't play the CDRW's. The whole technology for writing them is a bit different, so a typical audio CD player isn't going to be able to play them... didn't come up with a good solution for this yet... if you copy the mixes to CDR so that you can listen to them, you have to finalize the CDR, and that wipes out being able to write any more songs to the CDR... and you wind up blowing eight or ten CDR blanks just checking your mixes... anybody got any brilliant ideas???? Email from John Wood (thanks!) saying that Best Buy currently has three-packs of Memorex CD-RW (audio use) for $19.99. I did an experiment the other day, one I've been thinking of doing for a while - took one of my SCMS protected CD copies and made a copy of it. I just set it up like a regular high speed dub; the 765 figured out that the tracks were SCMS protected, so shifted into "analog" mode to copy them (which means they were copied at 1x speed). By the way, when the deck shifted into "analog copying" mode during this dub, the VU meter didn't indicate any action at all. But the disk did copy. I got some email from Art Munson at Cassette House this morning. It said that they have "generic 80 minute digital audio 'consumer' recordable CDs." 10-pack for $23.90, even cheaper if you buy five packs. With jewel case. So... if anybody's been looking for the 80-minute 'audio' CD blanks, they now exist. Cassette house also has generic blanks, sans case, 100 pack for $225. Why didn't you just buy a CD writer for your computer? Because my computer is undersized and underpowered, meaning I'd probably have to replace the whole computer to create CDs on it. I'm sure I could have accomplished the same results - maybe better, as well as cheaper - with a computer setup, but I'm interested in putting music on CDs, not fighting with the computer. Can it be fooled into using standard writeable CD media? 12/11/1998: email from Tom Grizzard (thanks, Tom! ), who has verified that the swap trick does NOT work on the 765 - he tried it himself and spoke with others who have). The 765 checks for the "audio code" on the CD any time a new blank is inserted, not just when the "open door" button is used to change blanks. What is this "audio CD" thing? And why are the CDs more expensive? Update 12/7/98 - email from Nick Verban (thanks!) suggests checking out the TDK website which lists a number of places to mail order CD blanks. In particular, he suggests checking here. (the "Cassette House" at this URL is another place that has a pretty good reputation among tape traders). What about SCMS copy protection? Yes, the 765 uses it, and it uses it in a way that's going to annoy people who want to use the 765 as a studio "mixdown" deck. I did a mixdown of some 8-track masters onto my CDRW disc; then I did a digital copy of that disc to a CDR, which would be my "master disc." When I put that CDR into the play side of the 765 and try to do a digital dub of the disc, the machine tells me that I CANNOT copy it digitally; the machine will do "analog" copies, but not a digital dub. So anyone who wants to mix to CDRW, then copy the completed, correct mix to CDR and use the CDR as their master disc to make additional copies is going to be screwed by the SCMS protection scheme on the 765 :-(. own stuff on it) or the blank CD.